Once you have decided upon a mural design, your image and instructions are submitted to a skilled design team. The designers create a drawing, sketch, or mock-up image of your mural, along with a list of tile colors to be used and a price quote. 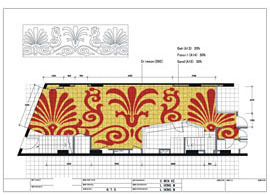 Visit the mural project drawings section of Hakatai's image gallery to see examples of sketches that our designers have created for past mural projects. The design process generally takes about 3 to 4 business days. This skilled design and development work is provided free of charge because we are confident that that you will find our price and quality unmatched by competitors.